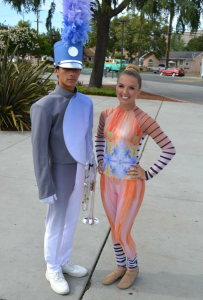 Blue Knights 2015 uniforms introduced. The word “Because” has a realm of possible explanations. At the same time, it does not have to be interpreted in any specific way. The 2015 concept is in fact “very Blue Knights” with the newfound identity that the drum corps has developed after a game-changing year in 2014. 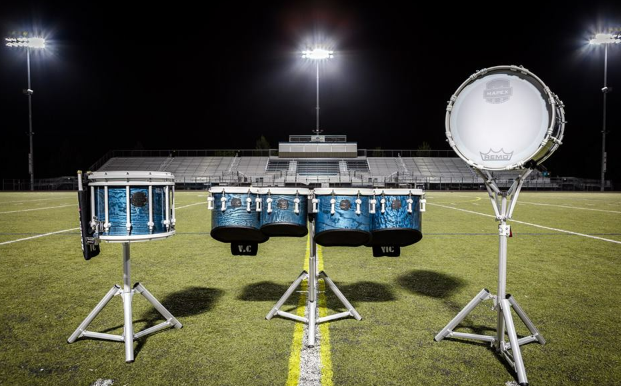 In the words of Tommy Keenum, Blue Knights’ Program Consultant and Designer, “This drum corps show is truly its own thing. When you are trying to create something fresh and new, it’s best to let it breathe and grow and become what it’s supposed to be as time goes on. ” The arrangers, designers and instructional staff are taking this exact route in order to produce a creative production unlike any of the others. Because the sky is blue, it makes me cry”. The 2015 version echoes the older 90s style drums. “Because the world is round,” Blue Knights have proudly kept their circle theme alive; the 33 props on the field are shaped in half-circles resembling mirrors, and there are several mirrored effects both in the drill and choreography. The horn-line has had tremendous movement training this season, which has translated to what makes the production unique. The color guard maneuvers around the props, and spins S-shaped wooden staffs. The aesthetic as a whole can be considered a slight “trip” with kaleidoscope patterns and a striped theme, which complement the new signature corps uniforms and vintage style drums. While we’re here on earth, what possibilities ensue? There is a sense of wonder and excitement of the world that has the potential to turn people on, blow minds, and even shed tears. From now on, “Because” will always be a valid excuse as to why Blue Knights are doing things the way they do, and it seems to be working out well thus far. 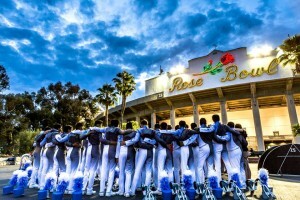 Blue Knights singing “I Go On” after their Rose Bowl performance in Pasadena, CA on June 27. 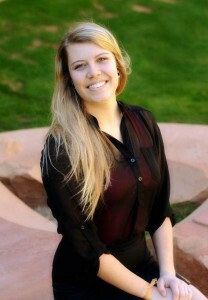 Sarah Anderson is graduating with a Bachelor’s of Science in Communication from Arizona State University in 2015. 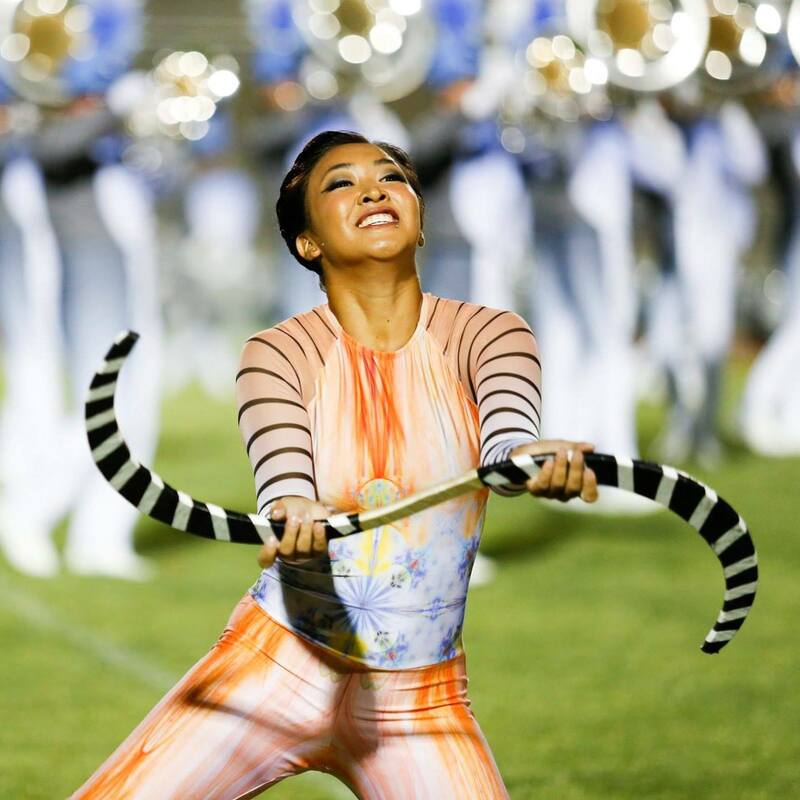 Her experience in the marching arts consists of 3 years with The Academy Drum & Bugle Corps color guard (2011-2013) and has aged-out with the Blue Knights Drum & Bugle Corps color guard in 2014. Sarah also performed three seasons with the world class Winter Guard International finalist FeniX Independent winter guard under the instruction of current Blue Knights Drum & Bugle Corps Color Guard staff. Sarah has been surrounded by an entire family of musicians and has played both the piano and violin since early childhood. Sarah is very excited about what this summer has to offer and will now have an opportunity to look at the other side of things, from a previous insider’s perspective.